We had a very enjoyable and varied reading in Glór last Saturday 12th January. 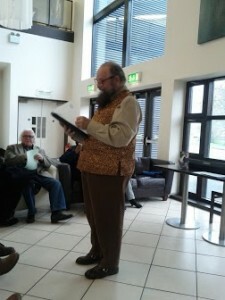 The guest poet, Mike Douse, treated us to a series of parodies he has written on some famous poems by well-known poets of the past and present, and ran a little competition for the audience to guess which poets were being parodied. Jinny Thomas from Feakle, a member of Clare Three-Legged Stool Poets, was the winner and will receive a hard-back book of poetry as a prize! Proceedings kicked off with a surprise visit from Dutch poet Peter van Lier in the company of Frank Golden who popped in on their way to a launch in Ennistymon. Peter read 10 of his pieces in Dutch and English. Frank also read a recent poem. Several members of the audience also contributed poems of their own during the ‘open mic’ section. Patrick Stack acted as MC. Music was provided by Peter Kay who played some of his own compositions on his keyboard, and Cathy Desmond played us out with a beautiful Irish piece on her viola. Our January Poetry reading takes place at the usual time (2pm) in Glór next Saturday 12th. This month’s guest poet is Mike Douse, who had a poem published in the Solstice edition (21 December 2012) of the Clare Champion.